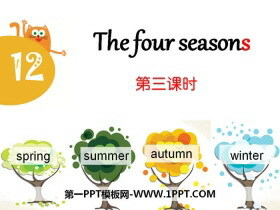 《The four seasons》PPT下载 第一部分内容：Look and chant Spring is warm. The plants grow and grow. Summer is hot. The sun shines and shines. Autumn is cool. The leaves fall and fall. Winter is cold. 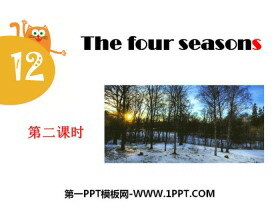 The wind bl..
《The four seasons》PPT课件 第一部分内容：Look and chant Spring, spring, Nice and warm. Spring, spring, I like spring. ____, _____, ____ and ____. ____, _____. I like _____. 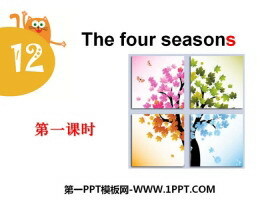 ... ... ... 《The four seasons》PPT..
《The four seasons》PPT 第一部分内容：Look and think Colours are everywhere. But sometimes How many seasons are there in a year? Look and learn Four seasons make a year. What are they? 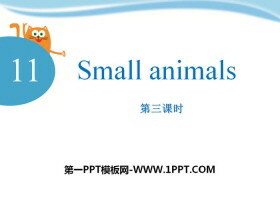 Look and feel What season..
《Small animals》PPT下载 第一部分内容：Story time It is a nice day! Lets go fishing! What is it,Mum? What is it,Mum? I'm sorry, Mum. Look,Mum!A big fish! Well done! 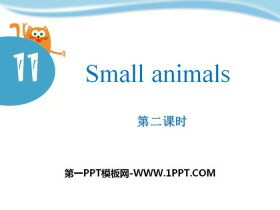 ... ... ... 《Small animals》PPT，第二部分内..
《Small animals》PPT课件 第一部分内容：What's in the box? It's thin. Its tail is long. Its ears are big. Its eyes are big. It's brown. What's in the box? It's fat. Its tail is long. Its eyes are big. 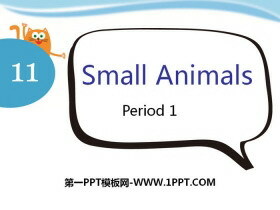 Its ears a..
《Small animals》PPT 第一部分内容：task Task 1 Practice in your group. Please say it out one by one. What is it? It is a ________. Its ears are long. Its teeth are long. Its nose is small. Its tail is short. 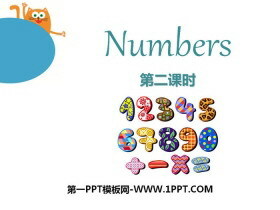 Ta..
《Numbers》PPT课件 第一部分内容：新课导入 Good morning, boys and girls. I have a good news(消息) for you. Today, I have some challenges（挑战） for you. 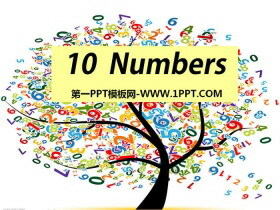 If you can pass the challenge, you will get a chance（机..
《Numbers》PPT 第一部分内容：Say out the food 1 apple 2 pears 3 pies 4 eggs 5 bananas 6 hamburgers 7 ice creams 8 cakes 9 biscuits 10 sweets ... ... ... 《Numbers》PPT，第二部分内容：Let's act What do you like?.. 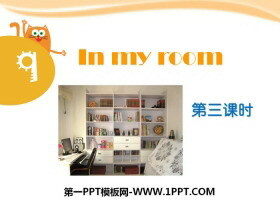 《In my room》PPT下载 第一部分内容：Quick response Is this a ? Are these ? Yes, it is. Yes, they are. No, it isnt. No, they arent. ... ... ... 《In my room》PPT，第二部分内容：Ask and answer Look! 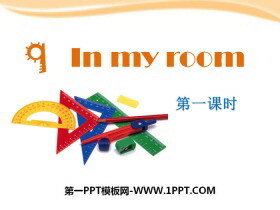 This is my ro..
《In my room》PPT课件 第一部分内容：Point and say desk chair bag book pen desks chairs bags books pens pencil ruler rubber pencil case pencils rulers rubbers pencil cases Think and say Look! 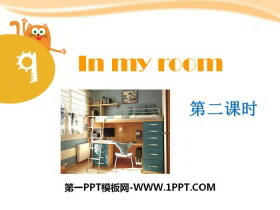 This is my It is Th..
《In my room》PPT 第一部分内容：Think and say Look ! This is a _________. Q: What else can we see in the classroom? desk chair This is a desk. This is a chair. Q: Do you share a desk with your deskmate? 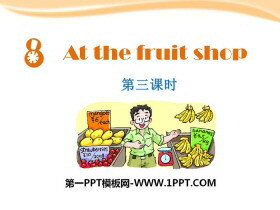 This is..
《At the fruit shop》PPT下载 第一部分内容：Point and say peach peaches strawberry strawberries watermelon watermelons grape grapes Say and act Can I help you? _____, please. I like ____(s). How much is it? How ..